Firstly, before you purchase a woodburning stove contact a qualified fitter in your area for an idea of the installation cost. Check out heta’s website for more information on qualified fitters. The cost should be affordable if you already have an existing masonry clay lined chimney in the home that is in use and in good condition, although this may require a twin wall flexible stainless steel liner for solid fuel should the clay liner have a cross sectional area greater than 20% of the woodburning stove flue pipe. Your qualified fitter can advise you on this. In the case of a woodburning stove into a new situation in the home with no existing chimney, a twin wall rigid and insulated stainless steel class1 flue for solid fuel will need to be fitted. Once again the qualified fitter can advise on this. Other requirements such as the building of a masonry clay lined chimney instead of a twin walled rigid and insulated stainless steel flue system will require the services of a builder. Bear in mind in both of the above cases you will need to consult your local building control and possibly planning in the case of a masonry chimney before carrying out any work. Please see one of our other articles on Ventilation and fitting of woodburning stoves with references to building control regulations. Now let us get down to the matter in hand. Ensure you can get a good supply of seasoned wood so the woodburning stove will combust as designed and give high efficiency.There are many wood farms in the market place to-day that provide this service. Ensure you buy from a company that uses a tree replanting programme, thereby helping the balance of nature. Many people when purchasing a traditional stove prefer cast-iron because of its lifespan, looks and long heat retention. The heat output of a cast-iron woodburning or multifuel traditional style stove will be much greater than the same size of a steel traditional style stove. Nowadays traditional looking steel stoves although plainer in looks are very well insulated with scamalux fireboard and the doors along with the internal grate systems are usually made of cast-iron. 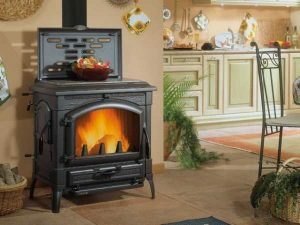 There are a multitude of woodburning stoves in the marketplace to-day, made from cast-iron or steel and claiming high efficiency and clean combustion. Ensure that the woodburning stove carries a C E approval stamp which shows that it has been tested by an authorities body for combustion and emissions. In the case of taller contemporary/modern steel convector stoves look for the Din+ approval which means it has acquired the high German standards for combustion and emissions. Many manufacturers to-day have there castings made abroad in places like Poland, Hungary, Bosnia, Bulgaria, India etc and the well known one China. Remember China is the home of castings and although I have seen some poor excuses for stoves emanating from China in the past, I have more recently seen some well made, quality traditional cast-iron Multi Fuel and contemporary steel stoves that have been tested and carry full CE approvals for combustion and emissions. Prices may vary greatly form manufacturer to manufacturer but many woodburning stove suppliers now buy directly from countries like China so you should find these competitively priced. How long this will last no-one knows but as the quality and standards improve from China and the employees standards of living and wages rise it will not be long before their prices are close or even on a par with Europe. While you are carrying out your research why not also consider a multifuel stove as opposed to a woodburning only stove . These stoves will burn coal, smokeless fuel, dry peat and can easily be converted into a dedicated woodburner if you have a good and steady supply of seasoned wood. It is a simple case in many of the traditional multifuel stoves of removing the grate and ashpan, and placing a layer of sand on the cast-iron internal base for insulation. It is a good idea to place a retention bar between the burning wood and the door so that the stove can be re-filled safely when lit, without the concerns of burning wood embers falling from the stove when the door is opened. The seasoned wood then burns directly on top of sand covered base with the primary air vent at the base of the stove door kept closed and the air vent above the door used to control the burning. The reason for this is that coal and other fossil fuels need a good air source under the fire bed to aid combustion whereas seasoned wood burns best with an air flow over the top of the wood. Wood ash can be left for several days before emptying . Always leave a good bed of ash under the wood when re-lighting the stove. For more information or to make an appointment, call us 01159 523053 or email us [email protected] visit our website www.nottinghamstoves.com.